2. Then apply NYX Jumbo pencil Milk to your whole lid, also to lower lashline to give a light base so that the colors really pop. 3. 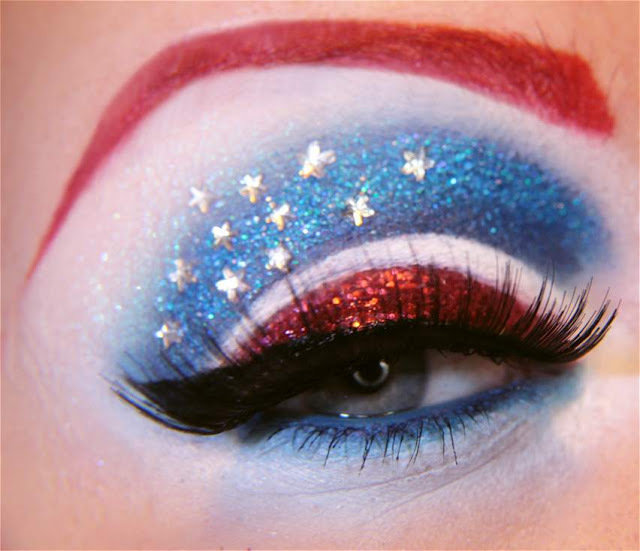 Start applying blue shadow (Sugarpill Afterparty) to above the crease, blend upwards. Leave the crease untouched. Apply blue also to lower lashline. 4. 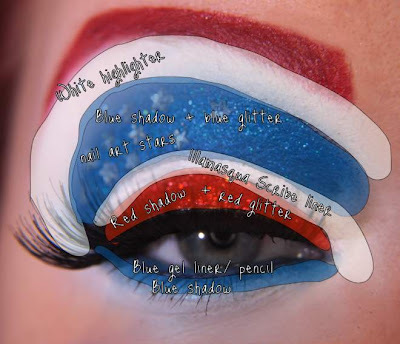 Use Fyrinnae Pixie Epoxy as a base to attach blue glitter (The Body Needs Holo Blue) over the shadow. 5. Then apply red shadow to whole lid. Again, use Fyrinnae Pixie Epoxy as a base for red glitter (The Body Needs Red Glitter). Make sure the crease is still untouched. 6.Apply white shadow (Sugarpill Tako) to highlight, overlay with Sugarpill Lumi chromalust. 7. Finally use liquid white Illamasqua Scribe liner to define the crease. Ok, this will be my 1st of May look since it totally matches my new shoes. :D I can't make decent weird-colored eyebrows, though... My own brows keep showing and looking awful and making everything a mess. Cover them with a full coverage concealer. Mine are dark brown that's what I do. Amazing and crazy like always! thanks for sharing! Amazing work, love all the looks.. was thinking of doing a couple myself haha! my hubby thinks this is the best one.. we can't wait to see avangers! You are the best in whole world! 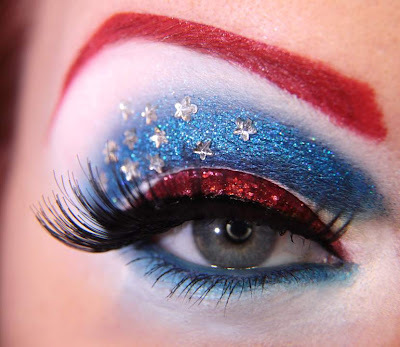 This looks amazing, I love the red eyebrow with the red glitter lid and the stars. I love everything! this is so cool!! very creative! I just wanted to say this is totally gorgeous and my favorite out of them. Gorgeous. I love the 50s feel that the false eyelashes gives it! You are ah-mazing! This is incredible! Hy! total fan! I really believe you're one of the most talented make up bloggers ever! What color/brand is that on the eyebrows??? you're an artist ♥ I love your looks! Amazing detail! Love the step by step instructions- what characters are you planning on doing next? Love It, can't wait to try it. Amazing, can you teach me how to draw a Dutch ( Netherlands) flag then, please ! Also, I think it's hilarious that while the actual finished product is sharp and super-classy, the diagram that you have with the color-coded overlay looks like Bozo the Clown. Argh. That sounds mean, but it is absolutely not! It's just the diagram outline and color-wash that make it look that way. I hope the humor doesn't dissipate when I press "Publish" and you read this. I am so going to copy this! O.k., o.k., I'm going to TRY. It would be fantastic for the 4th of July, also! While there is no question your makeup skill is spectacular your photography is also superb! Thank you for sharing so us less inventive people can look so cool! So cool! I am now buying the makeup palette. You have such pretty eyes! I love to see more of your works. May I ask how can I recreate these looks( the Avengers) on Asian eyes. The space from my eyebrows(my eyebrows are really thick) to my eyes are quite short. Please help! you're a great artist I love. PS: is beautiful. beautiful, beautiful your hair red. you are beautiful! Love this look, can you explain the eyebrow look and how you achieved it as well? 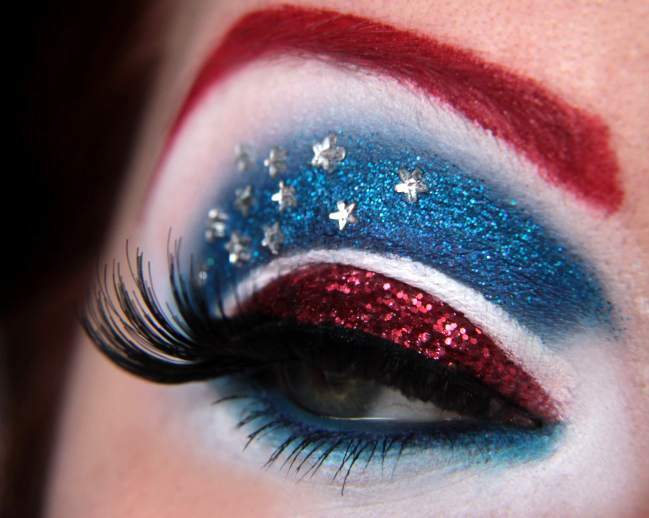 I would love to replicate this in a similar fashion for the 4th of July, it's gorgeous! I'm a french girl (sorry for my english..^^) and I discover your blog of make-up thanks to "Tête de thon", a girl blogger who do make-up too and nail art. I want you to knw that I love your blog !!! You're very beautiful, nice, talented and full of inspiration !!! Your make-up are so gorgeous, amazing, beautiful, eccentric and I love them !!!! Thanks for the tutorial you do sometimes, it's really nice !!! Where did you get the stars? I enjoy reading your blog, It will be provide affordable cosmetics product collection to get affordable price.